Lactose monohydrate, microcrystalline cellulose, magnesium stearate, povidone, colloidal silicon dioxide, Talc uritied), .crosscarmellose sodium. – Mosapride improves esophageal motility for patient with (GERD). – Mosapride increases esophageal bolus transit. – Mosapride shortens gastric emptying time. – Mosapride reduces acid reflux variables (assessed using ambulatory pH monitoring). 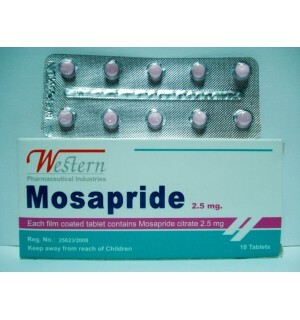 – After oral administration of single dose of Mosapride 5-40 mg, peak Mosapride concentration (Cmax) were reached after-I hour. Mean elimination half-lives(t It,) were 1.4 – 2.0 hours. 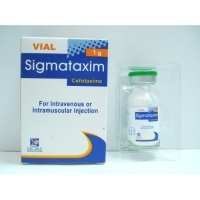 – Plasma Cmax (52.0 ng/ml) of the active M I metabolite occurred 0.5 hours after a single dose ofmosapride 40 mg. Elimination of M 1 (t It, = 4.3 hours). – Mosapnde is excreted in urine and feaces in 48 hours after administration of a single dose of Mo sap ride 5 mg.
– Heartburn, nausea, and vomiting caused by chronic gastritis. – General dosage regimen: I he reconunen<led usual dosage of Mosapride for adults is 5 .mg three times daily before or after meals. – Missed dosage: Take the missed dose as soon as possible. However, if it is amlost time for the next dose, skip the missing dose and continue your-regular dosing schedule. – Overdose: is you took much of this medicine (more than advised), check with your doctor. – Other: Do not stop taking this medicine without doctor’s instructions. – Hypersensitivity to Mosapride or any of the components. – Patients with hemorrhage or digestive blockage. – No serious adverse events were reported, however in only 2.71 % of patients who had received mosapridc for more than 2 week show abdominal pain, diarrhea, dry mouth, loose stool, rash, hives, nausea and feeling fullness, generalized fatigability and loss of appetite. – Elevated triglycrides in 1.0%, of patients and elevated AST, ALT and GGT in 1.4% of patients may occur. – Rarely veritricular tachycardia may occur in patient with hypokalaemia. – Jaundice. liver-dysfunction and fulminating hepatitis may rarely occur. Not be be used in pregnancy and lactation. – Store in dry place at Terrnperature not exceeding 3O”C. – Discard the remainder. Do not store. Cartoon box containing 1.2.3 (AI/PVC) blisters each of 10 tablets and inner leaflet. Not to be used without physician instructions.